Sciblogs | 40% of our post-doctoral fellowships gone? Who’s to blame? 40% of our post-doctoral fellowships gone? Who’s to blame? ’Are we failing our scientists?’ asks Nikki MacDonald in last Saturday’s Dominion Post. MacDonald posed this question after obtaining figures from the Ministry of Science and Innovation showing that the number of post-doctoral positions funded by the Ministry fell from 386 in 2007/8 to 323 in 2009/10. And this decline occurred before the government had axed the New Zealand Science & Technology post-doctoral fellowships in Budget 2010. When the last of the current NZ S&T post-doctoral fellows finish in a year or so, we may have lost almost 40% of the MSI funded post-doctoral positions that we had in 2007/8. No wonder then, that in 2011, Christchurch scientist Melanie Massaro and more than five hundred others from around the country called for action to address the lack of opportunities for post-doctoral researchers in New Zealand. According to MacDonald’s article, the current Minister of Science and Innovation, Stephen Joyce, disputes the notion that there are fewer opportunities for young scientists in New Zealand, although in doing so he has to describe the decrease in fellowships as ’… not an increasing number …’ *. However, the Minister notes that there has been an increase in PhD students in New Zealand and suggests that the science system ’… needs to encourage more young scientists to consider private-sector research’. 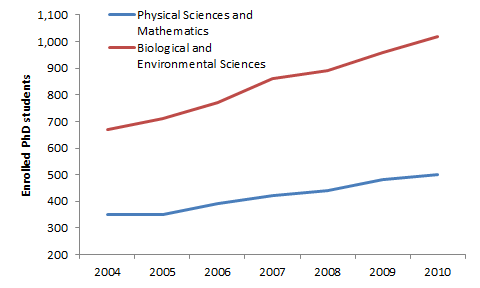 The figure below shows that there has indeed been a large increase in science PhD enrolments over the last eight years (source: Ministry of Education), particularly in biological and environmental sciences. I have blogged in the past about New Zealand industry’s need for more scientists. But are there private-sector jobs for our young scientists? The good news is that private sector R&D spending has been growing in New Zealand. The bad news is that this spending is not coming from the industries where most of our science graduates are likely to work. The figure below breaks New Zealand’s R&D spending down by industry and sector of performance (source: Statistics NZ)*. 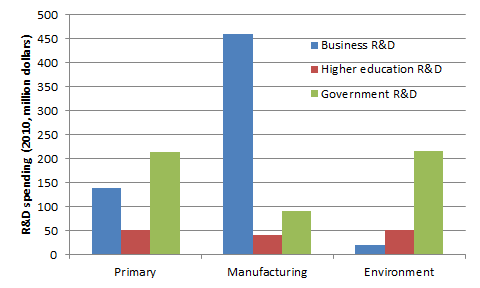 This figure shows that a large fraction of our private sector R&D is taking place in the manufacturing rather than the primary or environmental sector, while the bulk of our science PhD graduates are graduating in the biological and environmental sciences. These days the biological sciences have a much wider application than just the primary sector. Bioscience has applications in biotechnology and human health, for instance. However, there is a similar mismatch between public ($429m in 2010) and private (only $86m) bioscience spending. Although Statistics NZ found 99 firms conducting bioscience R&D in 2010, the R&D spend amounts to less than $1m per firm. If you have a PhD in the biological or environmental sciences, it seems you are going to look first to the government to continue your career. In contrast, private sector R&D spending in the manufacturing and services sector has leapt ahead over the last decade (up by 40% in real terms since 2004) to over $900m in 2010 (Statistics NZ). These sectors receive significantly less public funding than the primary or bioscience sector. Why do we have such a large mismatch between the allocation of public and private sector R&D? The environmental sciences (and much of the medical sciences) are largely public goods that are generally not going to be provided by the private sector. Government has a clear role in providing environmental and medical science so we should not be surprised that there is a big mismatch here between public and private sector spending. On the other hand, government investment in the primary sector has historically been justified by the need to address the difficulty that producers have in collectively investing in research and development. Although there are a number of primary sector industry bodies, most of these have ceased to fund significant R&D efforts in recent times. Outside of big industry organisations like Fonterra, I am not sure whether there are a large number of primary sector jobs that make direct use of the skills of biological scientists. Why have PhD enrolments in the biological and environmental sciences grown so strongly in the face of weak private sector demand? My analysis of the bibliometric output of the New Zealand science system showed that productivity (measured by papers per FTE) has not changed much in the last two decades, while total output and the number of papers per dollar have both increased significantly . Our output has gone up, our costs have gone down, while our productivity has remained the same. To me this points to a science system increasingly fuelled by less expensive PhD students. There is no doubt that the loss of the NZ S&T post-doctoral fellowships in 2010 has been a big blow to the science system, but the decline in post-doc positions began before this. My guess is reflects the displacement of post-doctoral fellowships by less expensive PhD scholarships. Furthermore, the strong imbalance between public and private R&D spending in our innovation system means that we may be pumping out graduates in areas of science where there are fewer private sector opportunities. Looking for ways to shift funding from graduate students back to post-doctoral fellowships should be a priority for our public research organisations, particularly those responsible for areas of science where private sector spending is weak. * To be fair, I am not sure that Minister Joyce had seen the latest figures quoted here when he made his comments. S. C. Hendy ’New Zealand’s bibliometric record in research and development: 1990-2008’, New Zealand Science Review 67 56-59 (2010). 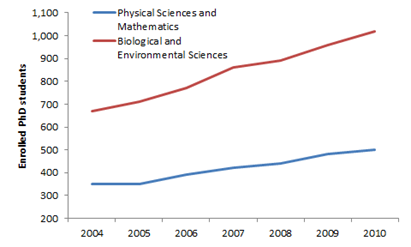 Why have PhD enrolments in the biological and environmental sciences grown so strongly in the face of weak private sector demand? The same reason as for the increase in all other types of PhD. The universities are strongly incentivised to churn out PhDs by the PBRF system, beause research degree completions count as 25% of each teriary institution’s points. @possum sure but with the economic downturn, returning to study also became a much more viable option for students that would possible have otherwise considered alternate career pathways. It would be really interesting to see what the levels of academics jobs across NZ has been in the times discussed for he above figures too! Shaun, you raise some interesting points but I think it is important to examine why postgraduate students choose to study their selected topics. I would suspect that it is largely due to their interests with less consideration for job outcomes. How many PhD supervisors discuss the future job options with prospective students? Also the number of students choosing environmental science as an option is probably due to an strong interest in the environment, something that both primary and manufacturing industries do not have at the top of their list of concerns. With regards to the number of academic jobs which become available in NZ, one must also ask how many NZers end up in these positions. I have observed that quit a few academic positions are filled by those who studied overseas (mind you so long as our graduates get jobs in other countries I guess this all might balance up).